I know many of us are heading to back to school (on either side of the big desk) and if you aren’t we’re still facing the end of summer. 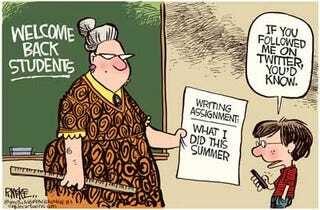 So, it’s time to share with the class: What did you this summer? I finished my degree at the end of April which meant I was free of obligations all summer for the first time in a long time. We took advantage of that and took a couple long road trips. The first one was a drive around Lake Michigan which was a lot of fun except for the midge fly infestation in Mackinaw. We even took the ferry out to the island which we never did during the eight years we lived in Michigan. A little later we drove to New Hampshire to visit with Dr. Mrs. Hatrack’s father and step-mother which wasn’t nearly as much fun except the two days we spent exploring the state without them. We also spent a couple days at the Ren Faire and one at the water park. Mix in a several day trips around to various places and we had a really good summer. I was also able to read more books for pleasure than I have in a long time which was great.